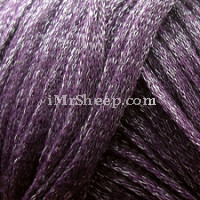 100% COTTON Hand Knitting Yarn, Canada: Pima, Organic, Stretch, Combed Cotton, Eco and Semi Luxury Blends. Cotton can occur not only in white, but also in natural rose, buff, brown, red, chocolate, green - even lilac, blue, and black. For centuries, cotton was a symbol of India. "It is so transparent and light that it looks as if its one is in no dress at all but has only smeared the body with pure water," the XIV-century Persian poet Amir Khusrau was speaking of muslin from Dacca and Deogiri. Cotton is classified as a natural, cellulosic, monocellular, staple fibre and has been cultivated for more than 5000 years. The quality of cotton fibre is based on its colour, staple, fineness, and strength. Usually, the longer fibres are finer and stronger. 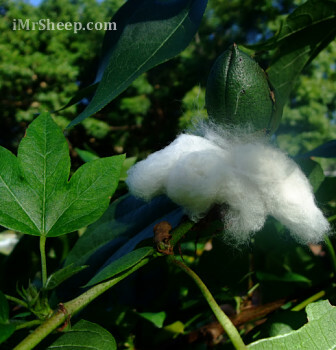 Cotton, the purest form of cellulose found in the nature, is the seed hair of the plants of the genus Gossypium. All domesticated species of cotton belong to one family of swamp mallow, Gossypium malavanceae. They grew originally as perennials, but through a process of human selection they developed what botanists refer to as an "annual habit" - flowering and fruiting within a single growing season. Cotton is a water-intensive crop. Nearly 15% of the virtual water in cotton goods represents water used to dilute wastewater from fertilized field plus the water used to transform cotton into yarn or fabric. 2,800 gallons of water are used to produce one cotton bedsheet. - Source: National Geographic, March 2010. Cotton Plant Cotton Plant Gossypium spp., Florida Botanical Gardens, photography ©imrsheep.com. Photography above: COTTON PLANT STEM © Irene & Mr. Sheep Co. There are 3 main types of commercial cotton: A) High quality long-staple cottons with the superior strength and uniformity, and staple length varying from 32 to 60 mm. Long-staple cotton fiber represent only about 3% of the entire world's cotton production. All long-staple cottons belong to Gossypium barbadense species. It is confirmed through modern molecular systematics that the origin of Gossypium barbadense was in Peru and Ecuador around a million years ago. The largest producers/exporters (2009) of long and extra-long staple cotton are China, India, United States, Brazil, Uzbekistan, Sudan. B) coarser species of cotton with shorter staple length, about 26-27 mm, such as American Upland Cotton. It presently is used for clothing, hammocks, wound dressings, etc. C) staple length is about 9-25 mm, this type of cotton commonly produced in various Asian countries. World cotton supply can be divided into six categories: extra-fine, fine, high-medium, medium, coarse count and waste/padding. 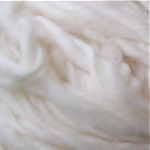 Peruvian Pima or American Egyptian Cotton fibre is fine, strong, lustrous, with silky soft feel and brilliant luster. Peruvian Pima cotton is harvested by hand, resulting in a brilliant (or creamy) white shade that can be easily dyed. The fibre has the staple length from 1-3/8" or 34.925 mm. It is so called extra long staple cotton (ELS). The name of Pima itself comes from the United States, and now is also commonly used in Peru, Australia, and Israel. Pima cotton was bred in Sacaton, Arizona, in 1910 and was released for commercial production in 1912 (Salt River Valley, Arizona, and Imperial Valley, California). Tangüis cotton is Peruvian Pima Cotton grown in Canete's Valley and the Central Coast of Peru. It is also known as Oro Blanco - White Gold. It is named after Fermín Tangüis - a Puerto Rican scientist who saved the Peruvian cotton industry at the beginning of 20th century. - Reference: The Story of Sea Island Cotton, The Charleston Museum (South Carolina). Egyptian Cotton is considered to be one of the best types of cotton, and is produced in various quality levels in long-staple and extra long-staple. Fibres are light brown, fine, strong, and up to 2-3/8" in length. "The name Egyptian cotton is also broadly recognized as being associated with quality products. 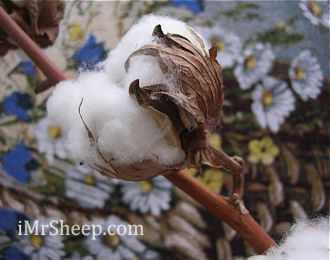 However, only a smaller percentage of Egyptian cotton produced each year is actually ELS cotton. The majority of Egyptian production is a long staple cotton variety called Giza 86. Unfortunately, the name of Egyptian cotton has been unable to maintain its high status level because of a variety of products that are made with Egyptian cotton, but are most often not made with the finest cottons from Egypt." Reference: Cotton Exporter's Guide. According to modern molecular systematics, the cotton species, which produces extra long staples, including so called Egyptian Cotton, is the native American species Gossypium barbadense, which is Peruvian Pima Cotton. References: Cotton, The Biography of a Revolutionary Fiber; The Story of Sea Island Cotton, The Charleston Museum. Organic Cotton accounts for less than approx 1/3rd of one percent of worldwide production. Most of it originating in Peru, Turkey, and Uganda. In United Sates, only approx 1/10th of one percent is grown organically, which is "round out to zero" according to a spokesman for the National Cotton Council. What makes yarn organic? » GUIPURE MOTIF JACKET 'EDEN GARDEN' © Moda Knitting № 558, Designer: Svetlana Ghalitsina. Sea Island Cotton, the finest black-seed cotton ever grown anywhere or at any time (Florida, Georgia and South Carolina coast) was developed by Kinsley Burden through his advanced method of seed selection. This superior cotton with its silky fiber was in high demand for the production of muslins and exquisite laces. It was a major export from 1786 until its demise in 1920 after the civil war between North and South (1861-1865), the loss of proper seed selection and hybridization with upland cotton (in the early 1900s, when the upland cotton was planted adjacent to the fields with the sea island variety) reducing the quality of the staple, and decrease in consumption (1912-1913) resulting in shifting mills to the new, coarser, long -staple Egyptian cotton - Sakellaridis. Also, two great calamities were the final stages in declining of Sea Island cotton production: a great tidal wave in 1893 and the arrival of the boll weevil in 1918 ending the sea island cotton industry in the 1919-1920 growing season. Thereafter the greatest ever cotton disappeared, making room for the new, more important than cotton, basically provision crops such as sweet potatoes, corn and other crops raised for the farmers' own needs, producing income. Although the genetic base of the Sea Island cotton survives and a similar quality long-staple cotton could be planted, but not on a large scale, the true sea island cotton is gone forever. "The continuous genetic line from the last crops of South Carolina Sea Island cotton was lost, and cannot be replaced." Reference: The Story of Sea Island Cotton, The Charleston Museum. Mercerization is a finishing process for cotton using caustic soda (lye) to improve strength of the yarn, ability to take dye, and luster (if done under tension). It was discovered in 1844 by John Mercer (England). What is Lisle ? Lisle is a strong, hard-twisted two-ply yarn made of long staple cotton fiber, and is usually mercerized to achieve a smooth finish. It is named after the city of Lisle (Lille) in France. FYI, we think of cotton as White, but actually it is Pale Grey in the pod. During the pre-Inca Andean civilization, natural cotton was vibrantly multicoloured, or even chocolate brown. Later, it was cultivated in shades of brown, yellow, russet, and lilac hues. During the pre-Columbian times, textile fibers were bleached not only by drying on the sun, but also by treatment with lye, minerals, and plant juices. To whiten cotton fiber, the Aztecs used lyewater as a bleaching agent as well as a mineral called Tizatlalli (White Earth). In northern Colombia, the acid-sweet juice of Caña Agria (a plant of the ginger family) was a bleaching solution. Reference: Chemical Art and Technologies of Indigenous Americans, Burton L. Gordon (2009).  Frequent Question: Where can I purchase fresh or dried cotton stems? A: From time to time, natural cotton plant stems/stalks are sold, e.g., in Fortinos' Fresh Flowers Department.